This miniseries dramatizes the stories of some of the best-known characters in the Bible, such as Noah (Lew Ayres), who answered God's call to build an ark, and Abraham (Gene Barry), who had to make an unthinkable choice between obedience and sacrifice. 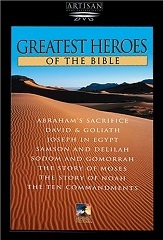 Other tales include that of Joseph (Sam Bottoms), who was sold into slavery by his brothers; shepherd David (Roger Kern), who defeated the giant Goliath (Ted Cassidy); Moses (John Marley), who received the Ten Commandments on Mount Sinai; and more. With Victor Jory as the narrator and Brad Crandell as the opening narrator. Also with appearances by Mark Lenard, Anne Francis, Frank Gorshin, Vince Edwards, Victoria Principal, Sherry Jackson, Michael Ansara, David Hedison, June Lockhart, Paul Carr, Cameron Mitchell, Albert Salmi, John Hoyt, Steven Keats and John Saxon.